Chelsea boss Maurizio Sarri has hailed the showing of Eden Hazard following the club's 2-0 Premier League triumph over West Ham United on Monday night. The Belgium international's future has been a regular point of discussion over the past few months, but this has not hampered his performances on the playing field. Hazard was the main difference maker against the Hammers with a goal in either half and one of those included a rampaging dribble from 30 yards to score a stunning world class goal. Speaking after the game, Sarri acknowledged that it is difficult to pursue another player with the same attributes as Hazard, and he remains hopeful that the Belgian will stay put with the club next season. He said: "It's impossible to find another Hazard; at the moment there isn't another Hazard. The level is so high. So in the world you can't find another player like that. So I hope that Hazard can stay here, otherwise we have to try something different." 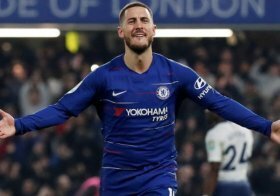 Hazard scored his 15th and 16th goals of the Premier League season against the Hammers and that has ensured his best-ever return in the top-flight. He has contributed a further 12 assists to the team's cause. The 28-year-old has 15 months remaining on his current Chelsea deal.